For both archeology and nature lovers Agrigento with its Scala dei Turchi is a must! Agrigento and Scala dei Turchi Tour starts with pick-up at your accomodation, at around 8.30 am in the morning, with a comfortble minivan. Agrigneto visit tour is arrange for a small group, maximum 8 people. 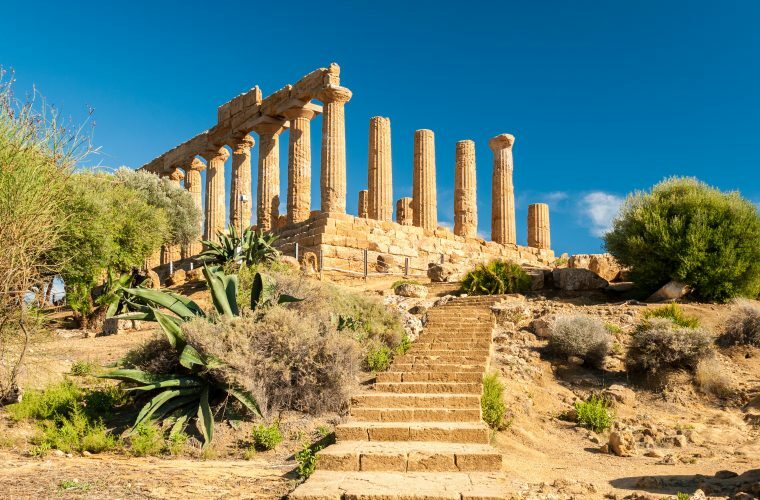 The first stop of Agrigento and Scala dei Turchi Tour will be in Agrigento City. This town used to be the richest of all the Greek colonies. Its wealth can still be admired by visiting the beautiful and impressive “Valley of the Temples“. A UNESCO World Heritage Site since 1997, you will see some of the best preserved Greek temples in the world. Pindar, the Greek poet and writer, described it as “one of the most beautiful cities of those inhabited by mortals”. “Valle dei Templi” is famous for its well-preserved temples, seven in total. Temple of Concordia is one of the best preserved Greek temples in the world helping the site to gain the classic UNESCO world heritage award. In the site, you can also visit the remains of many other temples dedicated to various divinity like Juno, Hercules, Hephaestus and Athena. Before moving towards the second part of the Tour, we will offer you a rich tasting of Sicilian typical products, accompanied by water and red wine of Mt. Etna. Or, if you prefer, you will have a hour of leisure time to have lunch in one of the many characteristic restaurants in the alleys of the city. Then, the Agrigento and Scala dei Turchi Tour will get you to one of the most amazing beach site in Sicily. 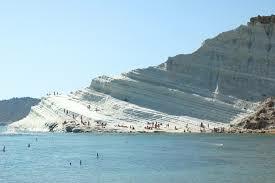 A few kilometers away from Agrigento you will find the “Scala dei Turchi”, literally “Turkish steps”. A dazzling white rock formation, rising from the clear blue sea like giant steps. Walking this gentle slope, high above the sea on your feet, will let you feel a unique experience. The Scala is formed by marl, a sedimentary rock with a characteristic white color. It lies between two sandy beaches, and is accessed through a limestone rock formation in the shape of a staircase, hence the name. The latter part of the name derives from the frequent raids carried on by Moors. The municipality of Realmonte applied for the inclusion of the Scala dei Turchi (together with the nearby Roman Villa Aurea) in the UNESCO Heritage List. Free time to enjoy one of the most famous beach in Sicily. 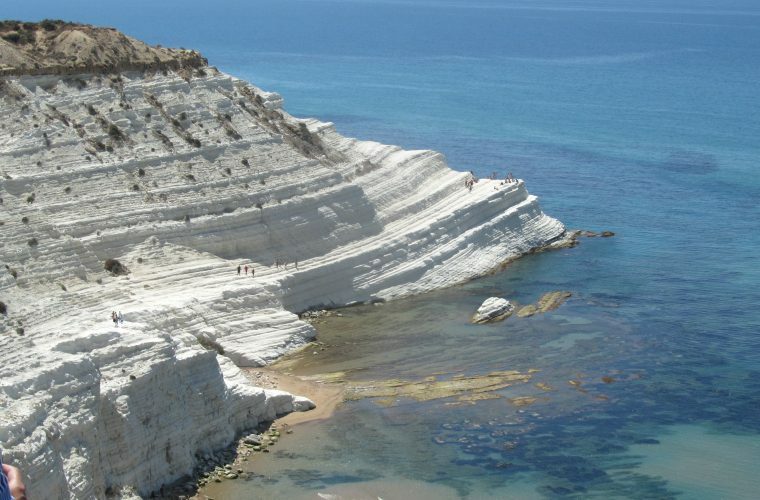 The “Scala dei Turchi” is a magnificent, blinding, white jewel that frames the clear blue sea. One cannot describe the view and communicate it all: you have to live immersed with all your five senses in the magic of this incredible cliff of white marl. It’s a fascinating place, where centuries of rain and wind have carved a natural staircase and whose white color is made more dazzling by the sunlight. This monumental white piece of Man is not only a natural feature, but is also a part of local legends: it is said that the Saracen pirates (for the Sicilians, the “Turks”, which is a negative connotation that indicates all the people that were once devoted to piracy), docked ships in the calm, clean waters, protected by the “Scala”, and climbed these natural “steps” to reach the top of the cliff and raid local villages, including the village of Realmonte. The Valley of the Temples is a wide archaeological area of Sicily in excellent condition. Its complex of temples corresponds to the old Akragas, an ancient greek village and the nucleus of the city of Agrigento. Today it is a regional archaeological park and part of the UNESCO World Heritage Site. The archaeological area is characterized by the remains of ten Doric temples from the Hellenistic era, three sanctuaries, a great concentration of necropolises, hydraulic works, fortifications, part of a roman district built on Greek plant and two Agoras (meeting centers) . The valley is a very famous tourist destination, and the main symbol of Sicily’s cultural and archaeological heritage.